There’s a picture alongside here of yours truly sampling a lurid blue cocktail, a Sapphire Martini if I remember correctly. The photograph was taken in the Commodore Club on Cunard’s Queen Mary 2 some years ago, and it may now be time for an update. In which case, I could probably do worse than have my portrait taken with a new cocktail devised to mark the 140th anniversary of Holland America Line. The Dutch Heritage is orange, in keeping with the official colour of the country’s Royal Family, and is a mix of Aperol, vodka and triple sec, shaken and garnished with an appropriate slice of fruit. 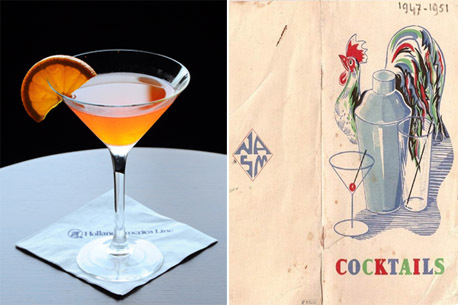 It is one of a number of drinks inspired by HAL’s history being served this summer on the company’s 15-strong fleet and listed in a menu with a period cover reprinted from an original used on the Nieuw Amsterdam in the 1940s. If the drinks are good value, then Holland America’s fares are an even better deal at the moment. To mark the anniversary, there’s a $140 per stateroom on-board credit added to every booking made in April. Cheers!